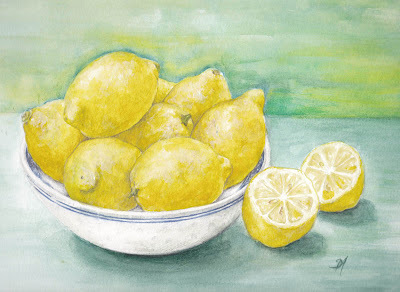 I can smell these lemons! Lovely! You continue to inspire me. Your work is so lovely. Great composition, and so well painted as always! Nice zesty looking lemons! =) Beautiful background too Debra. Mind I say, the bowl is perfectly symmetrical and I was very convinced that I could pick one up off my screen a while ago. Mmmm lemons, the fruit that has 100+ uses and tastes great (just read a new article about lemons again )... Its a lovely painting, and I like the back ground as a nice calming contrast against the fresh yellows. Wow, fantastic colors! It's a gorgeous piece, and the lemons texture looks amazing! Lovely, fresh painting. I can almost smell them!